Reading & Phonics through Spelling takes five essential components of reading – phonemic awareness, phonics, fluency, vocabulary and reading comprehension – and systematically teaches students using a discovery and sound-based approach to phonics instruction. Each week students will discover spelling patterns for different sounds, and keep a guide book journal. Homework is completed each week using the A Reason For Spelling workbooks. This approach to reading and phonics gives a solid foundation while also using proven methods for students with a variety of reading difficulties. Level II is a live, 60 minute a week class. 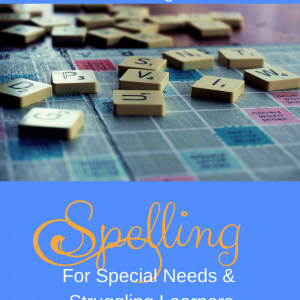 This class explores spelling rules for vowels and consonants, including numerous exceptions. We also work with prefixes and suffixes, and how to chunk multi-syllabic words to aid in the processes of reading and spelling. This course is designed to help your special needs or struggling learner gain mastery and success, building confidence and ability through skills acquisition. Our trained staff is committed to providing gentle, guided and proven instruction. Classes for our Struggling Learners Program are very small, up to six students. Higher-level thinking skills will be developed and supported in this interactive, small-group instruction that encourages problem solving, and works on metacognition, an important executive functioning skill related to study skills in all academic areas. Classes are warm and inviting, in an atmosphere where anxiety is reduced and thinking is maximized. How are our classes different than Tutoring?Tutoring is a form of reteaching or breaking down learning into smaller steps to help someone who struggles. Our classes go beyond that, evaluating where each student is on a concept, and helping them be successful as they learn the concepts. We use questioning to guide students through the learning process, and to help them understand and correct mistakes they are making in the math processes. The classes are formatted as a cooperative environment where students see how other kids process the information and discuss how we think through games and questions. The classroom is a safe place to discuss how they think through information. The end result helps students to see how they learn, and to apply that to other areas of their academic lives. Reading and Phonics through Spelling Level II is a live, 60 minutes a week class taught by Amy Vickrey, MSE. You might also be interested in American Sign Language. Check out our Course Catalog for other phenomenal courses offered through True North Homeschool Academy.